It's time for May's NewBeauty TestTube! If you aren't familiar with NewBeauty TestTube, it is a beauty sampling program that includes both full and deluxe size samples of must-have beauty products. It's a great mix of makeup, skincare and haircare. I always feel so pampered with these TestTubes! Let's see what this month included. Hair | One of my favorite things included this month is the MarulaOil Perfecting Serum ($28). This light-weight serum nourishes hair with antioxidants and vitamins while providing ultimate shine. It helps tame flyaways and frizz as well. I love my serums so this is definitely going to good use! Another hair product included this month is the Hair Food Cleansing Conditioner ($10). This cleansing conditioner keeps hair hydrated while cleansing and conditioning at the same time. It's a great alternative to using too much shampoo this summer. It also has a great scent of jasmine and vanilla. Makeup | I'm a huge fan of mineral products for my skin. Colorescience Sunforgettable Brush-On Sunscreen (Sample, full size $64) is a great, portable way to get protection and a bit of coverage this summer. The built-in brush makes it really simple to sweep on just the right amount of product. Great for in your purse and on-the-go! Skincare | One item included this month is a personal favorite of mine - the Farmhouse Fresh Hand Cream ($14). Scents varied this month but I received Whoopie Cream which I've always wanted to try. This formula is hydrating, light-weight and ideal for in your purse because it doesn't leave your hands feeling greasy. For the face, this month's NewBeauty TestTube has included Skin&Co's Truffle Therapy Anti-Aging Serum (Sample, full size $70), Miss Spa's Deep Wrinkle Eye Treatment ($6.99), and Luzern Daily Moisturizer (Sample, full size $80). The Skin&Co Serum has hyaluronic acid and truffle extract which helps plump and smooth skin. The Miss Spa Eye Treatment gels help hydrate, plump and smooth in just one use. The Luzern moisturizer helps protect against environmental damage and life impurities away with bentonite and kaolin clay. 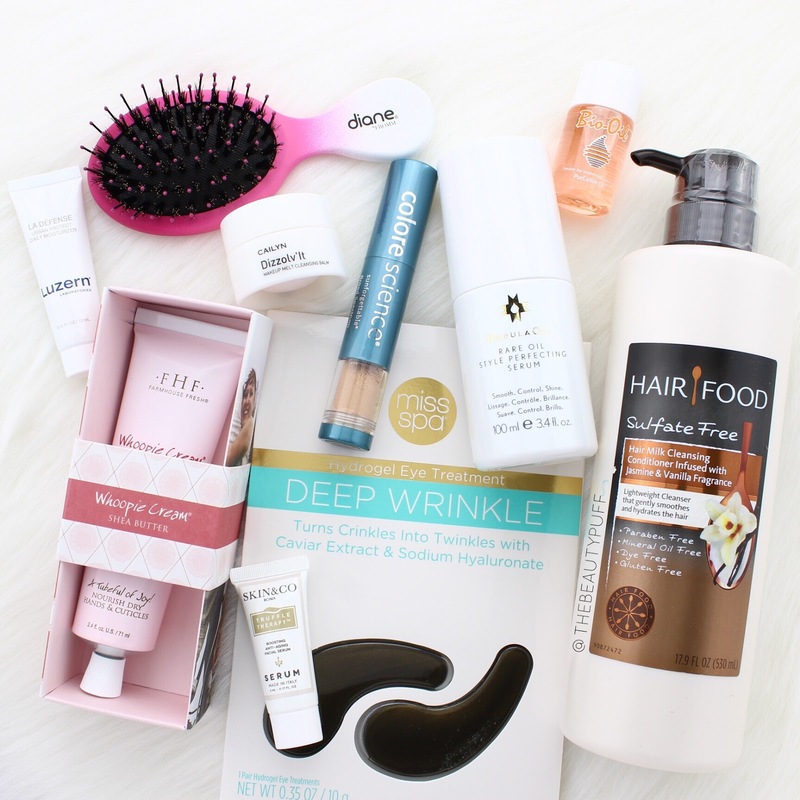 Varying Items | Other items included in my TestTube, which may vary, include Cailyn's Dizzolv' It Cleansing Balm ($5), a deluxe sample of Bio Oil ($3), and a Diane by Fromm travel brush ($5). All of these are repeat products for me but I love the cleansing balm and Bio Oil! They're great staple products I'll get a lot of use out of! The NewBeauty TestTube features 10+ products and ships every other month. Each tube is $29.95 + shipping and includes a subscription to NewBeauty magazine. Save on your first tube with the link below.